The MAC Pro Concealer Palette - Is It Worth the Fuss? If you cast your mind back a few months to when I did my London Haul, you'll remember I picked up the MAC Pro Conceal & Correct Palette. After imagining it to be the perfect palette for highlight and contour, and lusting after it every time I went into MAC, I knew it had to be mine. I picked up the shade Medium, because I generally contour more for occasions, where usually I wear fake tan, so when I'm pale these colours tend to be a bit too dark. The palette comes with 6 colours, 4 concealers and 2 correctors. I think it's shades NC25/NW25 upwards, with the two colours at the bottom being a yellow corrector and a salmon corrector. It's the Studio Finish concealer, so if you've tried that before, it's the same consistency as those in a handy palette form! I have the Studio Finish concealer in NW20 and have found it a good spot concealer, so I knew the consistency of these was going to be quite thick and long lasting. I can actually say I have used every single shade in the palette. For contour, I generally mix the two middle colours and apply it with the Real Techniques Pointed Foundation Brush on my cheekbones, forehead and jawline and blend it out with my foundation brush. I love the contoured look it gives, although it's definitely more Kim Kardashian then a natural look so it depends what you prefer. I also use the two top colours as a general concealer as these tend to be the right shade for me with fake tan on, and also whilst the fake tan is wearing off. The bottom shades are probably my least used, although the yellow corrector is fantastic for brightening and cancelling redness, whilst the salmon one gives a similar - although less glowy - effect as the YSL Touche Eclat, as it cancels out those blue tones under your eyes. All in all, I would say if you're a bit of a contour and highlight junkie like myself, it's definitely worth investing in this. Or if you vary in skin tone due to fake tanning (also like myself! ), it's quite nice to have a variety of concealers in one palette. If you prefer a light, natural finish (a la Vivianna Does Makeup), then it's probably not for you! 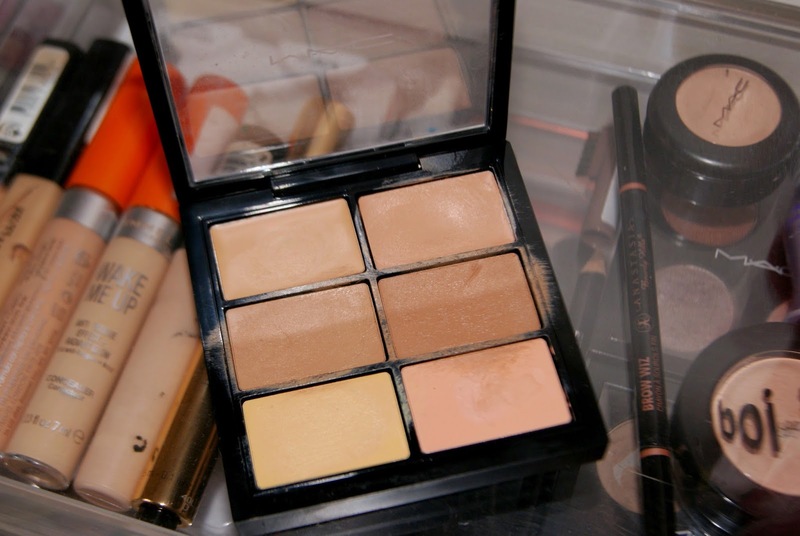 Have you ever tried the MAC Concealer Palettes?